Our purpose is to fund research. We met Ria, and her project in Dr. Kenneth van Golen’s lab at the University of Delaware has some interesting questions that need to be answered. We have made a commitment to her and Dr. van Golen to support this research. Breast cancer patients with skin metastases suffer greatly. The metastases can manifest as open seeping wounds that let off a pungent odor. Skin metastases therefore degrade the patient’s quality of life. They also present a problem for the caregiver. Regardless, there are few studies on how skin metastases form. The first report of cutaneous metastases in breast cancer was published in 1938. The investigators recognized that women who had received radiation as a therapy were more prone to develop skin metastases. More recent studies identified common characteristics between women who developed skin metastases after radiotherapy; they tended to have extensive invasion into the lymphatics, involvement of the lymphnodes and their tumors tended to be estrogen receptor negative. Melanoma has several characteristics that are similar to inflammatory breast cancer (IBC), including the ability to invade the dermal lymphatics and for tumor emboli. Like IBC, melanoma forms cutaneous metastases. Melanoma researchers have identified transforming growth factor beta (TGFβ) to be involved in forming melanoma skin metastasis. TGFβ can stimulate tumor cells to invade. Interestingly, TGFβ-stimulated invasion requires activation of another receptor by a molecule, hyaluronic acid (HA), which is present in large quantities in the dermal lymphatics where IBC emboli are found. TGFβ expression and signaling are very low in IBC patient tumors. Studies from our laboratory and from others suggest that this allows IBC to remain as tumor emboli. When we add TGFβ to IBC emboli, the emboli fall apart and the cells invade as single cells and not as a clump or cluster. Therefore, the metastatic behavior of the IBC cells is altered by TGFβ signaling. Therapeutic radiation causes normal cells such as skin fibroblasts to produce significant amounts of TGFβ. Here we will test the idea that therapeutic radiation causes normal cells to produce TGFβ, which in turn alters the metastatic behavior of the IBC cells causing them to metastasize to skin. Completion of this study will give us insight into the mechanisms and causes of IBC skin metastasis, we will see if therapies currently used in the clinic for other cancers can prevent skin metastasis and finally, we will perform gene discovery to identify other therapeutic targets and potentially biomarkers for identifying patients prone to skin metastases. We do not wish to cause confusion, this is research and it’s outcome can become important as we learn more but not to be confused as a change in standard of care. The current standard of care is to include radiation as an important part of tri-modal care. Regardless of its source, the information and materials on this site should not be considered medical advice to be used for self-diagnosis, and should not be relied upon as a substitute for regular consultations with qualified health professionals who are familiar with your individual medical history and needs and are following standard of care for IBC. Please understand that any medical question you may have should be discussed immediately with a qualified health professional and our mission at The IBC Network Foundation to encourage IBC education and research funding and is not a substitute for professional medical care. If you would like to read a more detailed overview, please see below. From Dr. van Golen’s lab. Cutaneous metastases are unusual in most cancers, but are most prevalent in breast cancer, which accounts for 60% of cutaneous metastases cases. Metastases to the skin are indicative of systemic spread of the tumor, are associated with decreased survival but most importantly result in a very poor quality of life. Most breast cancer patients suffering from cutaneous metastases have fungating wounds, which require constant care and treatment. Management of patients with cutaneous metastases presents a major challenge to health care providers. Despite all of this, little is known about the biology of cutaneous metastases, representing an important understudied area of breast cancer. Inflammatory breast cancer (IBC) is a highly aggressive form of breast cancer with unique molecular and phenotypic properties. Cutaneous metastases from internal cancers are relatively rare, occurring at a rate of 0.7-9%. However, cutaneous metastases occurs at a rate of >20% in IBC, similar to malignant melanoma. IBC cutaneous metastasis is associated with chest wall recurrences and significantly decreases the quality of life and survival of patients, however little is known about this aspect of the disease. Although significantly different in many aspects, IBC and melanoma share a number of similarities in disease presentation and progression. Both spread via dermal lymphatics, form intralymphatic emboli and have a propensity to form cutaneous metastases. Melanoma can also present as “inflammatory melanoma”, which resembles IBC phenotypically. Thus, new leads for studying IBC cutaneous metastasis can be gathered from the melanoma literature. Studies demonstrate a role for transforming growth factor beta (TGFβ) in the etiology of melanoma skin metastasis. TGFβ promotes tumor cell invasion and its expression can be induced in the stroma by radiation treatment. Recently, we have demonstrated low expression of TGFβ in IBC patients, which we believe promotes cohesive invasion of IBC cells. Stimulation of IBC cells with TGFβ causes altered tumor cell behavior such as stimulating single cell invasion. Thus, we postulate that radiation-induced TGFβ promotes metastasis of IBC to the skin. The findings from this study will be applied to breast cancer in general. This study aims to improve understanding what makes skin metastases grow (and spread) and attempt to determine how to stop it. Aim 1. 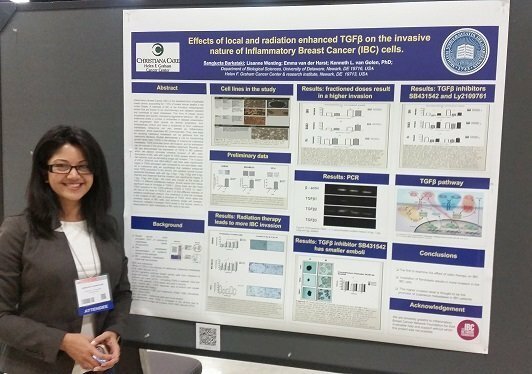 Determine if radiation-induced skin stromal cell TGFβ promotes IBC cell invasion and skin tumor growth. In this aim we will irradiate normal human skin fibroblasts and keratinocytes, measure TGFβ expression and determine the effect on the invasive and growth capabilities of IBC cell lines in vitro and in vivo. In addition, we will use commercially available inhibitors of TGFβ that are currently in clinical trials to determine their effect on preventing invasion and growth. Aim 2. Examine the TGFβ signaling pathways IBC cells. In this aim we will use microarray analysis to identify changes in gene expression due to TGFβ signaling in IBC cell lines. We will also compare gene expression profiles of IBC patient primary tumors (pre-treatment) with skin metastases. The goal of this aim is to identify biomarkers and alternative therapeutic targets of cutaneous metastasis.